Hello, Monday! I'm playing along with two challenges today. First the Simon Says Wednesday Photo Inspiration challenge. 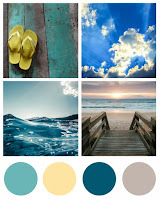 I was most inspired by the photo in the top left corner - the rough turquoise stripes with the bright yellow flip flops. I used some Paper Smooches Paint Strokes dies for the stripes and added yellow butterflies instead of flip flops. The thank you die is also Paper Smooches. 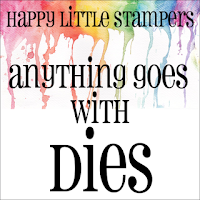 I'm also going to enter this in the Happy Little Stampers Anything Goes with Dies challenge. I just had a look at their shop which was silly because of course I now have a wish list of goodies from them! Next is a card for the current CAS-ual Fridays Colour Challenge. I went bold and bright but simple for this one - white embossing, fussy cutting and some gems using CAS-ual Fridays stamps. 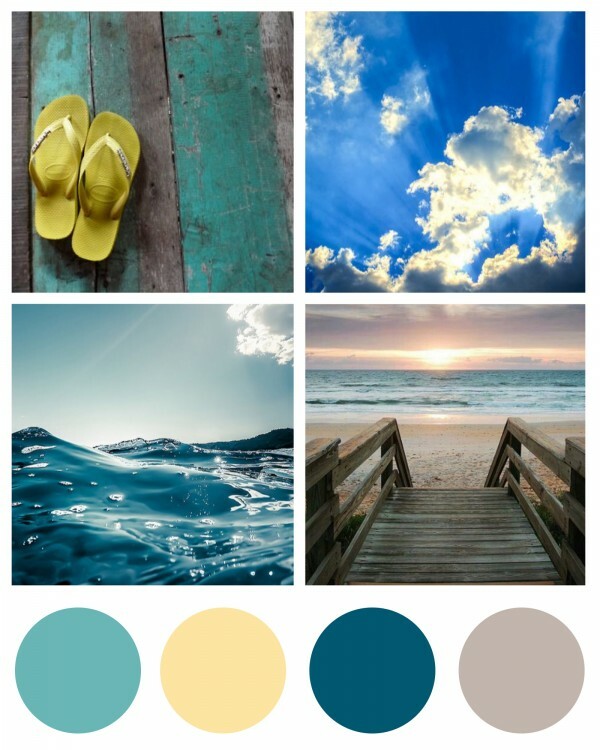 FABULOUS cards with Summer colors! 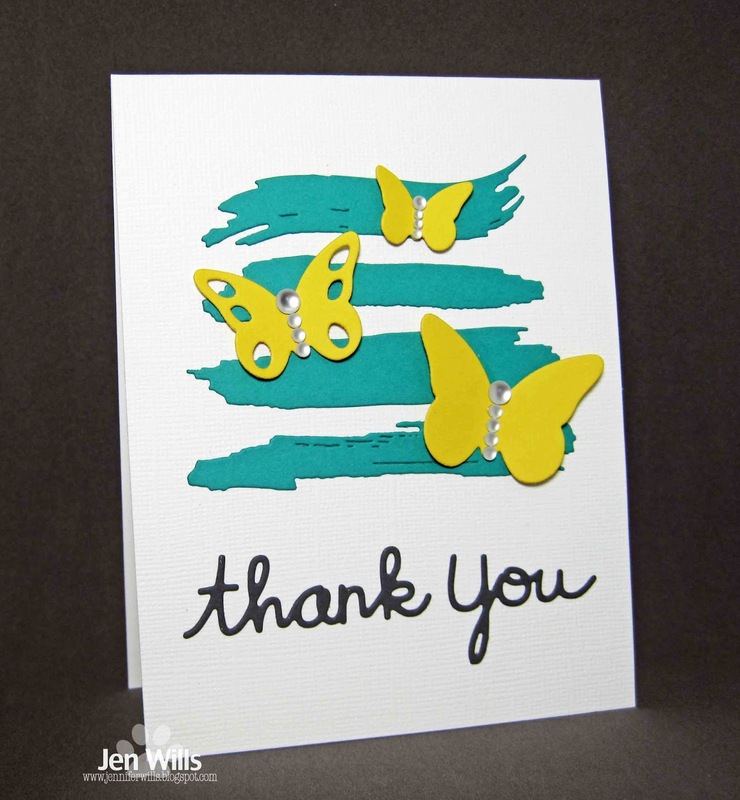 Love those butterflies and your diecut sentiment, Jen. 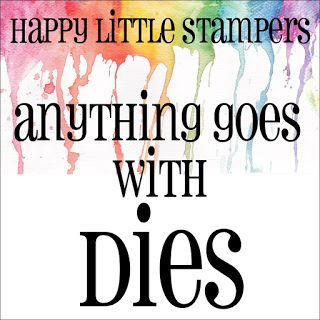 THANK YOU for playing along with HLS Anything Goes with Dies challenge this month. Fun take on our inspiration, Jen! I love the CAS style! Thanks for joining us at the Simon Says Stamp Wednesday challenge! Cute summer cards Jen!! I like the bling you added to your butterflies! Two beauties Jen! The first one looks like it could go in the PaperSmooches challenge too! 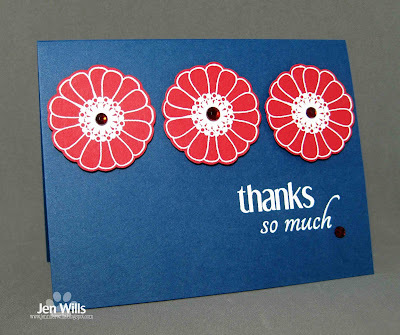 Such sweet, CAS cards Jen - the white embossing on the scarlet blooms looks amazing and you've reminded me to get my paint strokes dies out too! Thanks for playing along at CAS-ual Fridays! Two fantastic cards. Great job on the inspiration board. I always find those most difficult. And, love the red flowers on blue--so dramatic. The butterfly and paint strokes card is brilliant — I wouldn't have had a clue how to use those paint dies. 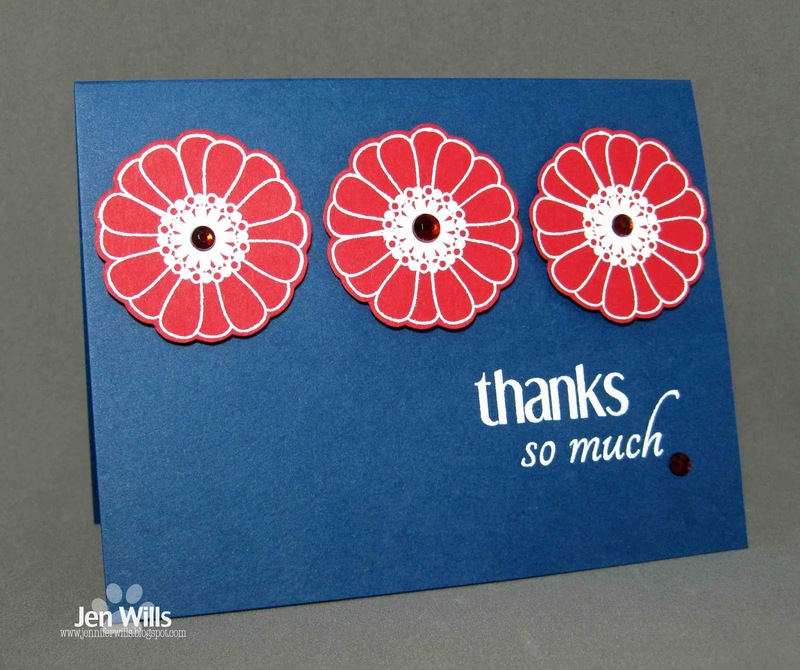 And the red flowers with white embossing are awesome. Love the bold color CAS card. Thank you for sharing at CAS-ual Fridays.